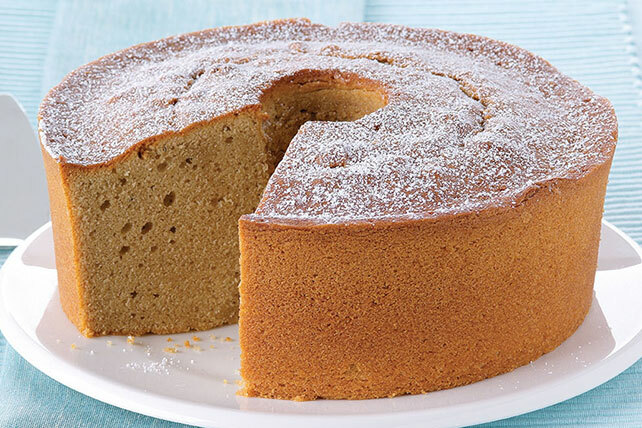 With brewed coffee baked right into it, this is an updated change on classic pound cake. Buttery with a hint of cinnamon, it’s sure to become a family favorite. Preheat oven to 350°F. Mix flour, baking powder, salt and cinnamon until well blended; set aside. Beat butter and granulated sugar in large bowl with electric mixer on medium speed until light and fluffy. Add eggs, 1 at a time, beating well after each addition. Add flour mixture alternately with coffee, beating until well blended after each addition. Pour into greased 10-inch tube pan or 12-cup fluted tube pan. Bake 1 hour 30 min. or until toothpick inserted near center comes out clean. Cool 10 min. ; loosen cake from side of pan. Gently remove cake from pan. Cool completely on wire rack. Sprinkle with powdered sugar. Pound cake is the perfect choice for a special occasion. Plan ahead and eat accordingly before indulging in a slice of this flavorful cake. Prepare batter as directed. Pour evenly into 2 greased 9x5-inch loaf pans. Bake at 350°F for 1 hour or until wooden toothpick inserted in centers comes out clean. Cool as directed before removing from pans.